Social media can sometimes give the impression that all is rosy in the world of resuscitation. We hear of the amazing saves, the wonders of ECMO, helicopters and heroic acts with great outcomes, but the reality is of course very different. Resuscitation does not succeed with the same frequency that we see on TV and many of our patients do not survive. In some cases such as a failure to get ROSC in cardiac arrest that inevitability comes fast and clear, but in others it does not and we are left with complex decisions about what we can reasonably offer to our patients and their families when a positive outcome looks uncertain or even impossible. Devastating Brain Injury (DBI) is a good example of this. We will all have been left to decide how to manage a patient with a severe and probably life ending brain injury. The scenario might go a little like this. 60 year old patient presents following fall from a roof. They were trying to fix the aerial when they lost footing and fell onto concrete. They arrive in your ED with a GCS of 4. They are intubated and ventliated but the CT scan shows a huge subdural, midline shift, cerbral contusions and extensive oedema. You phone your local Neurosurgeons who say that there is nothing they can do. They ask you to speak to the family, keep the patient comfortable and let nature take its course. They do not advise active management of the patient. If anything changes please give them a call back in the morning. If you don’t work in my world you might be surprised by this. The patient clearly has a devastating injury but they are declined by the specialists in that area because they cannot survive. This is not the time or place to get involved in that debate, there are many aspects to why it’s this way, but suffice to say it just is. The patient is not accepted by the neuro centre and they will probably die in your ED or on the ICU. In truth the neurosurgeons are almost always right of course. These patients do die, although that is clearly a self fulfilling prophecy. If a very early decision to not proceed with intensive management is made then that’s what will happen. And it’s hard, really hard somedays to have that conversation with relatives. They often arrive in hospital with the expectation that there is something that you can do, that you will do your very best for the patient and that modern medicine will work wonders. It’s then very hard to tell them that there is nothing more that we can do and that their loved one is dying. For some reason this always seems harder with trauma cases as opposed to other life ending events. Perhaps it’s because trauma occurs so suddenly and the time from being well to dying is so short. Some of those conversations haunt me still. Usually they are just awfully sad, but interspersed in them I’ve had people on their knees literally begging me to transfer their relatives to the neuro centre. I’ve been accused of playing god, of misleading them in earlier conversations or in contradicting colleagues who saw the patient at an earlier stage of their illness (when less information was available and the injuries less well defined). In truth I hate being the conduit of someone else’s decision. Someone who has never seen the patient, has not spoken with the relatives, who does not really know what their functional status truly is and who has made a tremendously difficult decision based on my history, examination and a CT scan makes the call to not transfer, operate or actively manage. When the decision of futility comes through I think many of us ask ourselves whether we advocated hard enough for our patients. All of us have lost sleep over such cases. I’m old enough and experienced enough to have lost many nights. For the families the devastation is clear. Whilst I might lose sleep their lives are rocked to the core and you see the pain it causes when you break the news. These are tough cases for everyone. This month the British Journal of Anaesthesia carries an important article on this topic. Written as a consensus statement it outlines the difficulties in managing the decisions and care of patients with a devastasting brain injury1. If you’re a resuscitationist then you should read it. It’s open access at the moment so get onto the site and download a copy for your files asap. Let’s get a definition out of the way first. 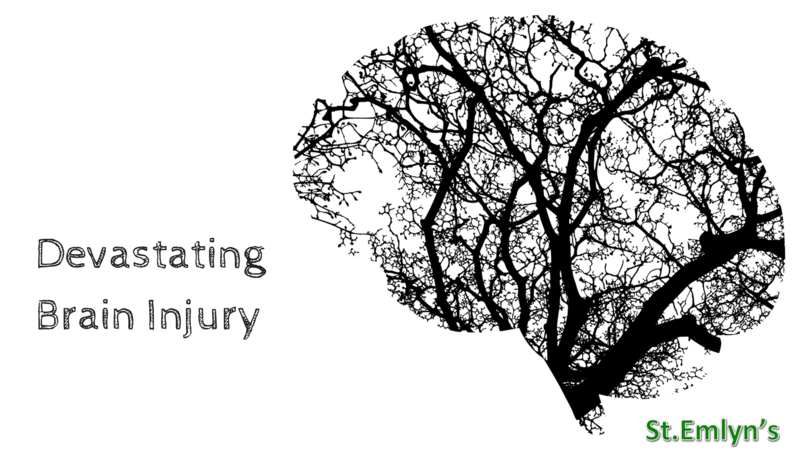 What do we mean by Devastating Brain Injury? Any neurological condition that is assessed at the time of hospital admission as an immediate threat to life or incompatible with good functional recovery AND where early limitation or withdrawal of therapy is being considered. This encompasses the group of patients who in my experience are left for local management and whom are not transferred to neuro centres on the basis of pre-traumatic function, age, CT findings and associated injury. Such patients are managed in the ED before typically being moved to the intensive care unit for palliation, consideration of organ transplantation, and end of life care. It’s worth stating here that I am consistently in awe of the skills of my ICU colleagues in managing these patients with care, dignity, time and kindness. 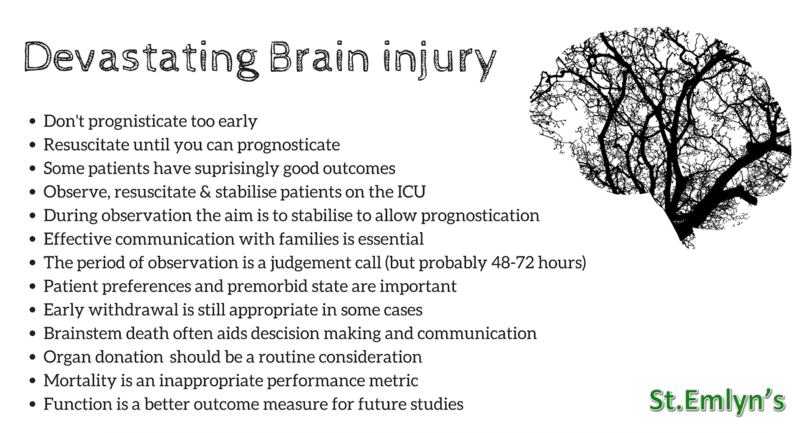 Underpinning this paper is the realisation that prognistication in what is perceived to be a devastasting brain injury is not as good as we thought2–5. A recent paper from Glasgow looked at the outcomes of GCS 3 patients with severe head injury and they did not all die (in that series over 50% survived and 13% had a positive GOS outcome). Similarly Mark Wilson looked at patients with head injury and bilaterally dilated pupils and again they don’t all die2. In fact many go on to have very positive outcomes. Other similar studies point us towards the idea that the outcomes from severe brain injury may not be quite as nihilistic as we thought. That is unless we withdraw treatment early on, if we do that then we are back to a self fulfilling prophecy. The bottom line is that we are probably poor in our ability to actively prognosticate patients with a perceived DBI in the early stages. Although scoring systems do exist many are imprecise for the individual patient and the vast majority look at mortality rather than functional outcome. It is arguably the latter which is most important to patients, families and society. In terms of function we probably just don’t know. There is a useful blog from Dan Harvey (lead author) on the JICS site explaining the rationale for the guidelines. In the resus room during the resuscitation and CT phase we may be very poor indeed at prognosticating an individual patient. We increasingly know this for our ROSC patients following cardiac arrest and so it is perhaps not that surprising that devastating brain injury may be a similar cohort. The paper outlines 12 aspects that we should all be doing to manage this group of patients better. For copyright reasons I can’t reproduce them here, but the key message for me is that unless there are other reasons (e.g. premorbid state, associated injuries) that preclude active managment then we should be managing this group of patients on the ICU until we can make firm decisions on prognosis. The accompanying editorial suggests this will likely be 48 hours (or 72 hours in the US)6. You should also look at a nice paper by Manara et al that outlines how we can enhance end of life care with or without organ donation4. Patients who are clearly brain dead are different of course. Brain stem death tests can be performed from 6 hours of the loss of the last brain stem reflex sometimes and can often provide clarity to clinicians and families as well as a legal definition of death. Any consultant can perform these tests usually it gets left to ICU because people are not comfortable with it due to a lack of familiarity. The national guidance is very clear from the AoMRC. You should also read and download the excellent accompanying editorial in the BJA6. It outlines several really important cognitive traps that we might succumb to when considering how to manage patients with DBI. It’s also open access at the moment so worth a read and download. Also thanks to the many people on twitter who have followed the blog and commented. Many comments, including those from the authors themselves including this important point from Davis Menon. I think he is absolutely right. I’d rather be right for those occasions where it really matters. First chance to read this blog properly – insightful & thought provoking. Is this going to change my practice? I think it will. I think it’s important to avoid absolute nihilism about CT scan findings and to keep actively managing our patients as we normally do. I think it will assist my conversations with relatives and whilst I will maintain my usual extremely cautious approach to questions about prognosis I think this paper will permit a more transparent and process based discussion about what happens next. It will probably change my approach with my neurosurgical colleagues too. Their comments to both state that the injury is perceived to be devastasting, but that if things change to get back to them is perhaps not as contradictory as it might first appear. We might need to be a little more understading with them and to always keep them in the loop as to a patients progress in the first 48 hours. I think there is a case here for these patients to all be transferred to a neuro-ICU, but in the UK at least I don’t see that happening with the current pressures. A change of practice in this direction would likely mean that all ICUs will feel the impact; as suchthere is a role for close liasion and training for non-specialist ICU teams in the management of severe brain injury. If we are to actively manage this group of patients to international standards then targeted traumatic brain injury management is needed and many will need ICP monitoring. Dan Horner who co-wrote this blog (St.Emlyn’s team member and neuro-intensivist/EM clinician) points out that if we were to transfer all these patients to neuro centres then there are significant knock on effects. We don’t have an unlimited capacity at tertiary centres and there may be unintended consequences. In addition, transfer of patients with devastating brain injury carry clinical, but also ethical risk – patients are often removed from their families (who may not be able to afford to travel to the tertiary centre) at the end of their life, to be cared for by unfamiliar doctors in an unfamiliar environment. Is this justified? Is this fair? We need to be clear about what we are hoping to achieve with early neurosurgical transfer despite a likely poor outcome, and the impact it will have on the patient, their relatives and tertiary centre capacity. The alternative is to manage these patients in non-neuro centres, but then we are looking at potential for variable levels of intervention and care by geography, which means that we may still face difficult decisions about ceilings of care and transportation priorities. The bottom line is that we are not going to be able to transfer every potential patient to a neuroICU from tomorrow. Systems will need to develop and adapt if we are to deliver the aspirations of this paper. This strategy will also make me more comfortable in conversations around organ donation as I think it takes some of the time pressures out of those discussions. It’s clear that we should start them early and that they are an integral part of DBI management, but the time window proposed in these guidelines gives a more realistic period for families to come to terms with difficult decisions. I don’t think I will. As we transition through our medical careers and as evidence changes we often look back at what we did in the past with a degree of concern. When you realise that your past practice was harmful it’s tough (for example starch solutions in sepsis), and perhaps we have withdrawn too early on patients in the past. We must always do the best we can at that particular moment in time, and of course change our practice as the evidence changes (this was a central tenent of one of Simon’s SMACC talks on decision making and evidence), but I guess I will worry about a few ‘what ifs’ from the past here as I think all of us who work in the resus room are sometimes haunted by the idea of ‘did we stop too soon’. Read and share the guidelines. They are open access at the moment (not sure how long that will last) so get onto the website now and have a read, share with colleagues and ask yourself what the implications might be for your department and team. Statement also hosted by the RCEM (http://www.rcem.ac.uk/docs/External%20Guidance/Management%20of%20Perceived%20Devastating%20Brain%20Injury%20-%20consensus%20statement%202018.pdf) where I assume it will remain open access in the long term. Great blog simon and dan. Thanks.